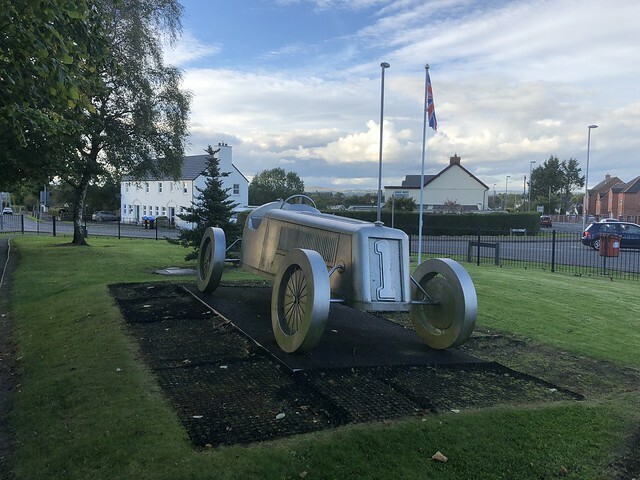 Most motor racing statues are located at race tracks, but the International Ulster Trophy Race Memorial in Ballyrobert, near Belfast International Airport, is in the centre of the village, although it had been a race track once upon a time. Back in 1946, the Ballyclare / Ballyrobert street circuit was used for the International Ulster Trophy Race on the 10th August. 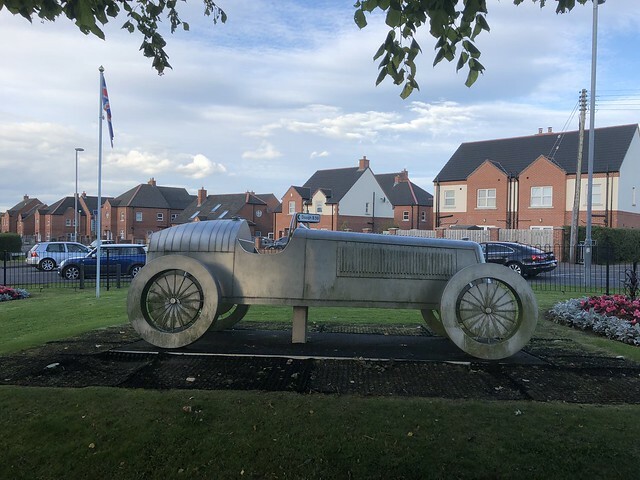 The circuit had previously been used in 1937 for the same race, but the 1946 running was the first international road race in the UK since the end of World War 2. The route took the drivers through Ballyrobert, along The Longshot in Ballyclare, and to Lindsay’s Corner in Doagh. The 1946 race was for cars not exceeding 1500CC, and was a fifty mile race featuring twelve laps of the circuit. It was a close finish, with Thailand’s Prince Birabongse, more commonly known as Bira, winning in his ERA, or English Racing Automobile, just ahead of Reg Parnell’s Maserati. Bira and Parnell were major names in motorsport at the time, and the two went on to race each other many times again including in the first Formula One World Championship race in 1950. The Ulster Trophy race was covered by Pathe News at the time, and is now on YouTube. The circuit was used again for the 1947 race, before moving to Dundrod. Although no longer a race circuit, the path of the race can still be seen as public roads. 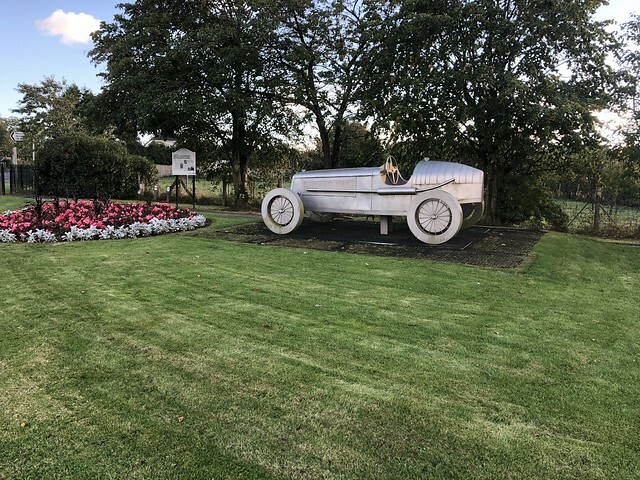 In 2014, a statue of Bira’s ERA was commissioned and erected in Ballyrobert as the International Ulster Trophy Race memorial, designed by Skelton Rainey. 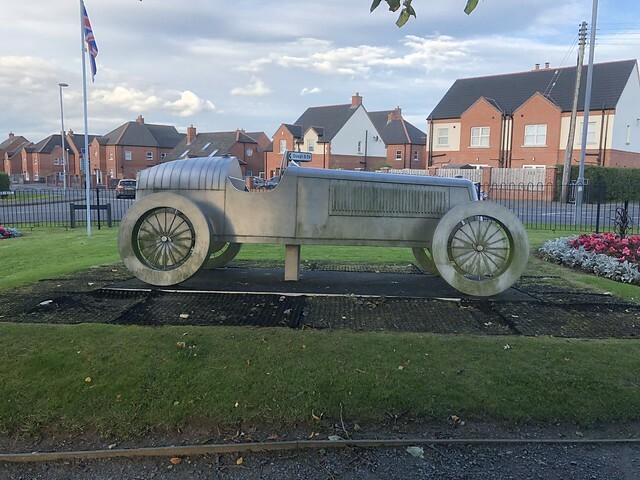 It is a striking memorial in a small garden in the village, and easy to find as it is just around the corner from Belfast International Airport. It is well worth a visit if you are in the area. County Antrim is also home to the Joey and Robert Dunlop memorial gardens, in Ballymoney. History, Motor Racing Bira, County Antrim, memorial, Northern Ireland, Ulster, Ulster TT. permalink.